Vaishali : Vaishali was one of the earliest republics in the world (6th century BC).It was here that Buddha preached his last sermon. 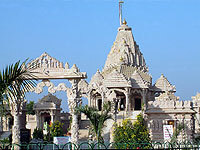 Vaishali, birthplace of Lord Mahavira is also Sacred to Jains. Patna : Patna once called Patliputra the capital of Bihar, is among the world's oldest capital cities with unbroken history of many centuries as imperial metropolis of the Mauryas and Guptas imperial dynasties. 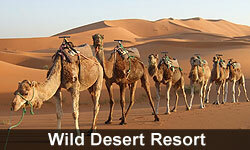 Rajgir : Rajgir,19 kms from Nalanda, was the ancient capital of Magadha Empire. 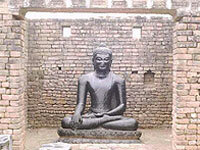 Lord Buddha often visited the monastery here to meditate and to preach. 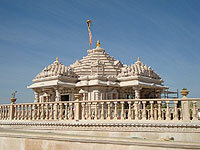 Rajgir is also a place sacred to the Jains, Since Lord Mahavira spent many years here. Pawapuri : In Pawapuri, or Apapuri, 38 kilometres from Rajgir and 90 kilometres from Patna, all sins end for a devout Jain. Lord Mahavira, the final tirthankar and founder of Jainism, breathed his last at this place. 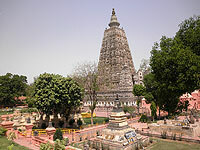 Bodhgaya : Near the holy city of Gaya, the Buddha attained enlightenment. The tree that had sheltered him came to be known as the Bodhi tree and the place Bodhgaya. Today Bodhgaya, an important place of pilgrimage, has a number of monasteries, some of them established by Buddhists of Japan, Thailand, Myanmar, Sri Lanka etc. Nalanda : A great centre of Buddhist learning, Nalanda came into prominence around the 5th century BC and was a flourishing university town with over ten thousand scholars and an extensive library. Kesaria : This Stupa is in fact one of the many memorable stupa remarkable event in the life of Buddha. Kesaria has a lofty brick mound capped by a solid brick tower of considerable size, which it self is the remain of a Buddhist Stupa. The mound is a ruin with a diameter of 68 feet at its base and a total height of 5� ft. originally it was crowned by a pinnacle which must have stood 80 or 90 ft above the ground. General Cunningham dated this monument to AD 200 to 700, and held that it was built upon the ruins of a much older and larger Stupa. It is the highest Stupa found in the country with a height of about 104� from the base.